Giant troughs that stretch across the asteroid Vesta may have formed after a fellow asteroid smacked into Vesta's south pole, researchers say. These findings add to evidence that, like Earth, Vesta is divided into a core, mantle and crust, supporting the theory that Vesta is a protoplanet that never fully developed into a planet. Vestais the brightest asteroid in the solar system, and the second-largest, a goliath 330 miles wide (530 kilometers) that circles the sun between the orbits of Mars and Jupiter with the rest of the main asteroid belt. NASA's Dawn spacecraft spent about a year orbiting the asteroid, but recently left Vesta to move on to the dwarf planet Ceres, which is considered the solar system's largest asteroid. Dawn's observations recently revealed that Vesta is enveloped in a surprisingly large amount of hydrogen. "I really didn't expect to see anything like what we found," lead study author Debra Buczkowski, a planetary geologist at the Johns Hopkins University's Applied Physics Laboratory in Laurel, Md., told SPACE.com. "The troughs on Vesta are spectacular, far more like features identified on the rocky planets and moons that we've studied than the other asteroids." These unusual troughs have puzzled scientists ever since Dawn helped discover them in 2011. Surface deformities on asteroids are usually straightforward cracks that form due to crashes with other asteroids, but the trenches seen on Vesta are too complex to be explained by simple collisions. New analysis of pictures Dawn took of Vesta's surface now suggest a large collision may have created the troughs, but only if Vesta was separated into crust, mantle and core layers, a quality normally seen in larger bodies such as planets. "Our models indicated that that these features might be so spectacular because Vesta really is more like a planet or a moon than like an asteroid," Buczkowski said. Each of these layers would vary in density and react differently to the force from the impact. A large collision would make a cracked surface on such a body slide apart. The result would be a type of trough known as graben, involving stretch marks that form after faults move apart and the ground between them sinks. One example on Earth of graben is Death Valley in California; other instances have been seen on the moon, Mars, Mercury, Venus and Jupiter's largest moon Ganymede. Images from Dawn show that Vesta's troughs have many of the qualities of graben, Buczkowski said. For instance, while the walls of troughs on simpler asteroids such as Eros and Lutetia are shaped like the letter V, troughs on Vesta have floors that are flat or curved, possess walls shaped like the letter U, and have bottoms that are relatively flat and slanted toward what is probably a dominant fault, much as what happens with graben on Earth. Another way Vesta's troughs might have formed has to do with the collision it experienced on its south pole, which gave the asteroid its current speedy spin rate, where it completes a rotation on its axis about once pevery 5.35 hours. Planetary scientist Britney Schmidt at the Institute for Geophysics in Austin, Texas, who did not take part in this study, suggested this whirling caused Vesta's equator to bulge outward so far and so fast that troughs resulted. "I really wouldn't call Britney's hypothesis conflicting," Buczkowski said. "I think the two models are complementary, and that it is entirely possible that the troughs are as large and deep as they are because both resultant stresses were at work." The scientists will continue to analyze Vesta data collected by Dawn to improve their computer simulations of its evolution. 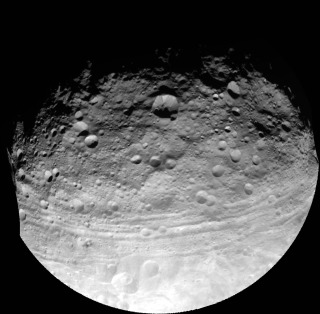 "I will also continue to study the smaller structures on Vesta," Buczkowski said. "There are numerous smaller structures on Vesta that need to be evaluated with the same level of detail — they are also important toward our understanding of Vesta's tectonic history." The researchers detail their findings in a paper to be published online Sept. 29 in the journal Geophysical Research Letters.